How do you earn loyalty? In today's connected world, having a great product or service isn't enough. You need to constantly engage consumers with relevant value. Access Development has 30+ years of experience helping companies engage customers and build loyalty. We want to share some of what we've learned with you, free of charge. How Do You Earn Engagement? It costs six times more to acquire a new customer versus keeping an existing one, as the old adage says. In other words, loyalty is very profitable. Unfortunately, loyalty is also very hard to capture. This isn’t like the good old days, when consumers were only exposed to a few brands with regularity. The Futures Company estimates that people living in urban areas in 1977 were exposed to as many as 2,000 ads per day, compared to 5,000 in 2007. Today, the ads are still there, but so is social media, which lives within a giant online ecosystem that consumes attention spans 24/7/365. By the time he/she goes to bed each night, a typical consumer has likely been exposed to over 10,000 marketing messages. and deliver something of relevance and value. It’s difficult but not impossible, and we’ll walk you through the three steps you can take today to engage your customers, and even better, train them to look to you to meet their needs. In a perfect world, your product is breathtaking and does everything your customers could ever hope it would. Those customers run out and share the good news, and their loyalty to your brand becomes a badge of public honor. This is called a cult following, and very few brands in the history of the world have earned anything akin to it. The majority of brands wrestle with competitors and pricing challenges, constantly trying to find positive differentiation while protecting slim profit margins. It’s why loyalty programs were invented – to incentivize customers to repeatedly pick one brand or product over others. What makes the difference between programs that work and those that fall by the wayside? 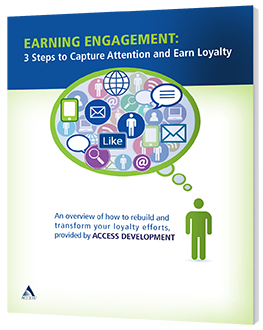 The most successful loyalty efforts create frequent engagement. Engagement is brand interaction, from a Facebook like to opening an email. It’s when a consumer follows a brand on Twitter or stops by their blog to quickly grab the latest news. deepens a connection between brand and consumer. Whether your brand is offering something of everyday use (e.g., bank, grocery store) or requires an annual membership (e.g., travel club, online service), positive engagement is what will keep your brand top of mind when the time for a purchase comes due. Your brand alone isn’t enough. There are simply too many distractions for consumers to stay tied to your brand: competitors, lower prices, and peer influence to name a few. Your brand isn’t going to be rewarded for simply selling a product or service that satisfies. Loyalty takes endless effort. Some pundits say that things like incentives, discounts, punch cards, and other loyalty tactics are a waste of time and don’t change consumer behavior. These days it takes more than a solid product sold at a fair price point to get customers to return over and over again. Simply put: repeat engagement leads to repeat purchases, and eliminates distractions. On average, customers encounter 56 brand touchpoints before they make a purchase. You can’t control all of these (online reviews, for instance) but you can make your own touchpoints incredibly valuable (which we’ll cover in the next section). By engaging customers with relevant value, you’re able to communicate the full breadth of what you offer and why you matter to them. That engagement is what allows you to stand out from the crowd to your customers, because quite frankly, a trustworthy brand isn’t as valuable as it used to be. A 2013 Neilsen survey found that 65% of shoppers worldwide consider price to be the most important factor in purchases. 87% of customers would abandon an in-store purchase for a 20% discount online. Price, service, and convenience outweigh brand in importance in nearly every survey that can be found. And it’s only going to get worse. The millennial generation is wielding its buying power, and it’s a savvy group that knows when they’re being marketed to. This is a generation that has yet to experience a healthy economy and thriftiness is ingrained at the top of their buying decisions. It should come as no surprise that among Millennials, 80% reach for the lowest price, and 60% say they have no qualms in moving away from their preferred brand to find a better price. Engagement will help you overcome many purchase obstacles your customers may have, paving a pathway for loyalty. But how is that engagement earned? Read on! Engagement is grabbing and retaining your customers’ attention in a positive, relevant manner, as often as possible. It’s what keeps your brand top of mind, so that they keep coming back to you for your services and products. Sounds great, right? But how do you earn engagement? Your best bet is to follow these three steps. If your product or service is amazing and you have no competitors, then congratulations, you’re good to go! For everyone else, answer this question: how am I impacting my customers’ lives on a daily basis? This is where relevant value comes in. You may think your brand’s relevance lies in the day-to-day functions your product or service provides, but your customers don’t see it that way when the bills and statements come due. In all actuality, they’re looking for a reason to cut back their spending, so your brand needs to focus on adding and communicating value. Outline for your customers what you do for them, and tell them the ROI, or how much money they’re saving by using your service/product. If possible, give them a monthly report. Make them smarter by giving them expertise at using your product or service. Create simple training documents or customer service scripts that help your users become experts with your products. Answer their questions before they even think to ask them. Proactive customer service, and content such as emails “did you know you can do ____ with our product?” make it clear you’re interested in extending the relationship beyond the customer’s purchase of your product or service. Provide exclusive access to upgrades or features that the public won’t be able to access for a while. This is a great way to show responsiveness to customer requests, as well as a way to communicate a smart investment in a product or service that’s going to evolve without extra cost to the customer. One of the smartest and easiest ways to add value is to combine forces with another brand or brands that consumers love. earn cash deposited directly into their accounts from popular local merchants. The program has seen steady growth for over a decade because it adds value within the everyday spending patterns of consumers, who prefer to shop in-store, close to home. Most people wouldn’t say they’re in love with their bank, but everyone has a favorite local restaurant or retailer. Zions AmaZing Deals gives customers a reason to engage with Zions on a daily basis, and as a result the bank has seen increased transactions and higher per-transaction spend among those enrolled in the program. A formal loyalty program helps with engagement, but many are too complex, with rewards hidden behind such high barriers that they actually have a negative impact on consumer attitudes. If impacting the customer on a regular basis is the goal, the rewards need to be easily attainable. The easier it is to receive the benefit, the more frequently they’ll engage. Loyalty rewards such as incentives, points, and recognition are all appealing to customers but they’ll stay active only if they see the value in them early on. One idea is high-value, low-cost rewards that they can acquire relatively early. Consider one Access client that rewards users for "checking in" to television programs. The app distributes points for checking into shows. Users can then redeem those points for products and gift cards. In response to user requests for more rewards and lower redemption hurdles, the app added a selection of discounts that could be attained for less points than the rest of the rewards. Instead of asking consumers to save up points for months to earn big ticket items, which could invite disinterest and inactivity, the app lowered the hurdles and communicated value through deals at popular national brands. Insurance companies, professional associations, and other businesses with regular recurring charges often struggle to communicate what exactly it is they provide consumers. For these companies to communicate real value – and give their customers reason to engage with them outside of paying the bills - it’s imperative that they show a clear return on customer investment. For many, that means benefits beyond the basic service. One Access client, a timeshare exchange company, operates a popular premium membership club that's among the largest in the industry. The company uses the Access discount network to help emphasize the value of that paid membership. Yes, sometimes you have to outright bribe a customer to pay attention to your brand. But it works; they’ll associate the benefit they received from those coupons with the name providing them. By creating and providing value to customers, you’re not only extending the reach of your brand but also placing it in association with other brands your customers love. A great in-store or in-person experience plays a big role in generating recurring sales, but does your influence extend outside the walls of your office? Your brand needs to be where your customers are, communicating how they communicate. The average attention span in 2013 was eight seconds (compared to nine seconds for a gold fish). That means your value needs to be obvious, and communicated through platforms that your customers are comfortable with. Consider your email, mobile, social, online and offline efforts not as an opportunity to market to customers, but instead to communicate value on a regular basis. The great thing about unexpected value is it gives you more chances to communicate with your customers. And they’ll welcome it, because you’re giving them something that they feel is relevant and impactful. You’ll get to those necessary 56 impressions quicker than other brands, because your customers will be looking for you. Each of those is an opportunity to say something other than “Give us your money.” Every time a business has an opportunity to promote a no-strings-attached message of value, they gain a measure of trust and attention from their customers. The message should remain consistent: reminding customers about the value your brand is making available to them. It’s also important that each channel have a feedback function, so that customers can engage with the business directly. We’ve said it multiple times, but it can’t be emphasized enough: there is no magic bullet for earning loyalty! It can come and go suddenly, and with Millennials soon to take over the economy, you can expect to see less and less of it for brands. What this means is your brand has to earn engagement on a regular (if not daily) basis. You earn it through frequently grabbing the fleeting attention of your customers. Like any other aspect of business, the success of engagement needs to be measured and refined constantly. While there is no specific engagement metric, there are ways you can tell if your efforts are paying off (that aren’t simple dollars and cents). Enrollees – It seems obvious, but measuring loyalty program enrollees is important because it can tell you if the promised value is compelling or not. If they’re not signing up, then the “What’s in it for them” isn’t being communicated, or isn’t appealing. Likes and followers– Experts have debated the value of Facebook Likes and Twitter followers for years now. The bottom line is this: people love to connect with brands through social media, and when they like or follow a brand, they’re opening themselves up to what that brand has to say. It’s fertile engagement ground. Open rates – Billions of people send hundreds of billions of emails each day. Watch closely to see how often yours are being opened, and what content in those emails people are engaging with. Comments – If you constantly solicit feedback, customers will provide the blueprint for how to build your brand and earn their loyalty. The most important thing is to have those feedback forums available. Let them know they can contact you anytime through phone numbers, web contact forms, blog comments, Facebook comments, Twitter replies, and so on. The more you hear from them, the more you’ll learn. Usage – How often are customers redeeming points and offers? And what effect do emails, social posts and other promotional channels have on usage? This metric will show if your loyalty program promises are realistic or not. Repeat Usage – Are customers returning to your program with frequency? What drives them back – is there a certain communication form or special offer that entices them? Use these metrics to find what works, then repeat that over and over again. Access discount programs keep consumers engaged with local and national deals delivered on-demand through a variety of platforms. We serve clients across dozens of industries, from professional associations and small businesses to insurance providers and banks. Follow us on your preferred social network or subscribe to our blog for customer engagement and loyalty tips and strategies.